We are hitting autumn full stride (or circle, if you are cycling), after a lovely quiet summer and fabulously packed "June is Bike Month". Municipal elections are over and thanks to all who gave it their best shot. It's time to return to routine --- maybe step up the cycle a notch for some of us! 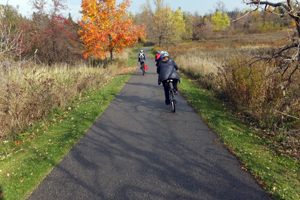 We have articles on Bike the Creek, our accomplishments since the last newsletter, Brampton Kids on Bikes, Curb Cut Issue, School Trip Planning App, Wearing a Helmet, and much more! To manage your subscription, click on one of the links below. We welcome your feedback and participation in all things about biking in Brampton!